The Senate candidates were among the nominees for state and local offices that the county party picked Tuesday night. Nassau County Democratic Committee members officially nominated their candidates for state and local offices Tuesday night, a day before the state convention kicks off. Hundreds of party supporters gathered at the Cradle of Aviation Museum to hear the announcements for state Assembly and Senate offices, as well as local and district court judgeships. The nominations were accepted during a meeting that lasted about 19 minutes. The state committee will meet for two days beginning Wednesday at Hofstra University in Hempstead. Officials stressed the importance of winning local races as critical to taking back the Democratic majority in the State Senate. There are 11 State Senate and five Assembly races. Jacobs said key Senate races are in the 7th District, where Democrats are backing North Hempstead Councilwoman Anna Kaplan against Republican incumbent Elaine Phillips; the 8th District, where Democratic Sen. John Brooks will face Republican Jeffrey P. Pravato. 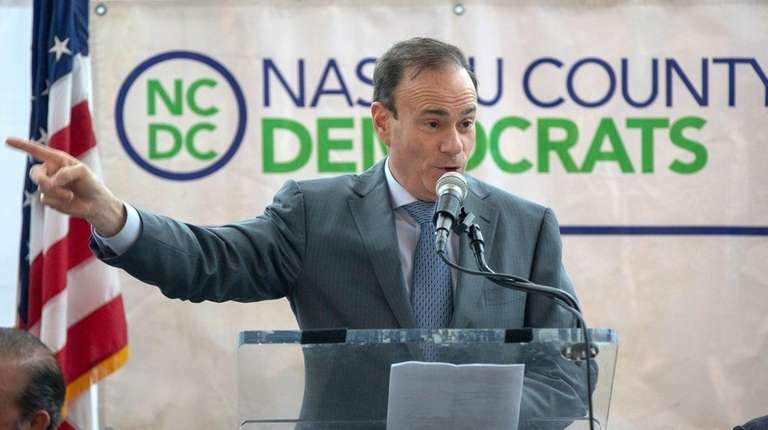 ; and the 9th District, where Sen. Todd Kaminsky (D-Long Beach) faces a challenge by Republican Francis X. Becker Jr.
Jacobs, chairman since 2001, said Democrats have been building momentum in the county since last year when Laura Curran won the county executive’s race and Laura Gillen won the Hempstead Town supervisor’s contest. Curran and Gillen attended the event. “I’m looking forward to a fantastic election in November,” Curran said. CORRECTION: The Nassau County Democratic Committee nominated Anna Kaplan to face incumbent Republican Elaine Phillips in the 7th State Senate District race. Democrats nominated Kevin Thomas to run in the 6th District, facing incumbent Republican Kemp Hannon. A previous version of this story misidentified the districts.